Nevium PPC Index October 2017 shows for the 30 days ended October 20th the Nevium PPC Index experienced a 13% increase, increasing from 76.56 to 85.72. Through October 2017, the Index has declined 39% since its 12 month high of 140.6 in April 2017. 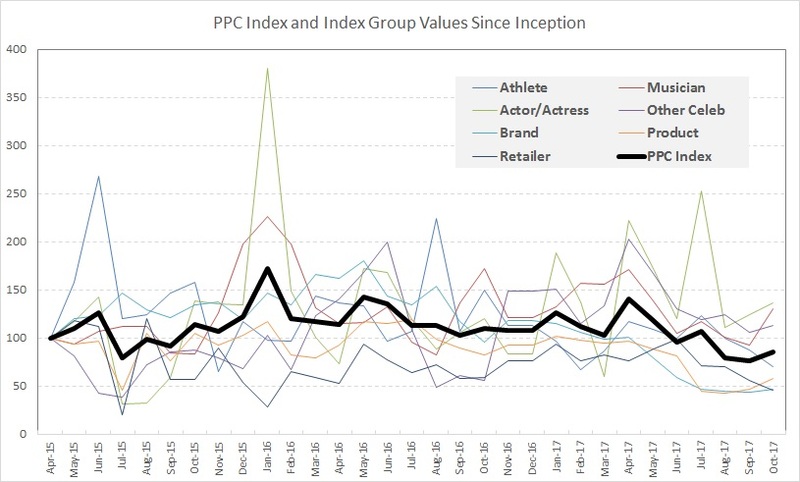 For the month of October 2017 the Index value increased for five of the seven keyword groups in our study. The Musician group experienced the greatest increase with an increase from 92.6 to 129.8. The only groups that decreased were Athletes which decreased from 87.4 to 69.7 and Retailers which decreased from 55.89 to 45.5. Floyd Mayweather’s PPC rate continued to be one the biggest movers in our index during 2017. In March 2017 the Mayweather PPC rate was $0.13. Leading up to his fight with Connor McGregor in September, Mayweather’s PPC rate increased over 1200% from the low in March 2017. This month, Mayweather’s PPC rate declined 62% from $1.72 in September to $0.65 in October. For the month of October 2017, the index constituents that experienced the largest increases were Mark Wahlberg and Gisele Bundchen. Wahlberg’s PPC rate increased 3044% from $0.09 to $2.83 and Gisele’s increased 2585% from $0.07 to $1.88.